Assembled to conform to the standards required to be used in medical settings. SF Cable' Hospital Grade Power Cords are assembled to conform to the standards required to be used in medical settings. These cables fulfill the requirements that the prong blades be made of solid brass construction without folding, the "Green Dot" marking to be displayed and Underwriters Laboratory UL817/60601-1/498 certifications. 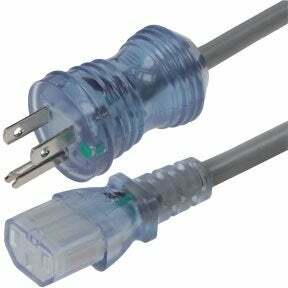 We have 16 AWG and 18 AWG hospital grade power cords available in various lengths. We source our products directly from ISO 9001-2000 registered manufacturers to cut the middlemen costs. All products are RoHS compliant and environment friendly. We also provide good after sales service and lifetime technical support on our products.